Christmas is quickly approaching, and amidst the holiday haste, the community provides some unique opportunities to celebrate the season. 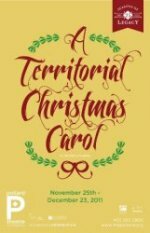 The Pollard Theatre in Downtown Guthrie presents “A Territorial Christmas Carol: An Oklahoma Tradition.” The show begins at 8 p.m. December 15, 16, 17 and 21. Additional matinee performances begin at 2 p.m. on the 17 and 18. Dickens’ holiday favorite was adapted by Oklahoma playwright Stephen P. Scott and is set during the Oklahoma Land Run. Scott’s adaptation has been performed for almost 25 years, featuring Scrooge as a coldhearted land baron. “A Territorial Christmas Carol” runs through December 23. Shepherd’s Cross in Claremore hosts “Living Nativity” December 15 through the 18 from 10:00 a.m. to 8:30 p.m. daily. The authentic Amish-built gambrel roof barn houses the walk-through Nativity. The event includes live animals and actor portrayals of Biblical characters. Other offerings such as weaving, spinning, a hands-on learning center, and children’s arts and crafts take place through the duration of the Nativity. The Christmas Train at the Oklahoma Railway Museum in Oklahoma City leaves the station December 17 at 10:30 a.m., Noon, 1:30 p.m., and 3:00 p.m. Each train ride lasts approximately 25 minutes, and children of all ages are welcome. For the kids there will be hot chocolate, caroling, and a reading of The Polar Express, and of course, Santa rides the train as a special guest. The Christmas Train only comes once a year. A “Victorian Christmas Walk” takes place in Downtown Guthrie at 5 p.m. on December 17. Arioso Consort performs its Christmas concert at 4 p.m. on December 18 at St. Mark the Evangelist Catholic Church in Norman. The Opolis in Norman hosts its 3rd Annual Opolis Toy Drive. Beau Jennings and the Tigers, Gentle Ghost, and Brine Webb begin playing at 9 p.m. on December 21. For more events and details, visit our calendar page.